When installing the different requirements, do they automatically install in the correct place, or do I need to put them somewhere specific. If it helps, I am running Windows 8.1 - 64 Bit. But my main concern is where to install these. So I finally got around to installing Blender, and it actually works. There are a few things I would like to learn. But I'll post my questions one at a time, hopefully I'll be able to understand things better by doing a little at a time. The files come in different formats, some are in (.obj) format, some in (.3ds) format, some in (.blend) format, etc., unfortunately, I'm not totally sure what file formats Blender will work with. This may be a dumb question, and I apologize if there's an easy answer that I haven't found yet, but is there a list floating around that will tell me what types of files Blender can work with? If you've got all of the above files installed, then you should see a list of the types of files Blender can work with when you choose File-> Import. I know you can import .obj files and I'm pretty sure you can import 3ds files, also. You should be able to just open the .blend files. (no import needed). Thanks Hoss, I'm still trying to learn and understand the absolute basics of Blender, which brings me to my next question. Question #2: When exporting a file from Blender to make it a Nif File (FFvt3R), what are the setting I should use? Again, I appreciate any and all advice I am able to get here. He has a screenshot of the settings in his tutorial. To be completely honest, I can't tell what is "turned on". You would think that the highlighted buttons would mean that something is activated, but I was using another Blender tutorial somewhere and I think that when the buttons are dark means that a feature is activated. So, I just clicked everything to match Ewzzy's picture. SickAlice, since you are skilled with Blender, maybe you could let us know what the buttons should look like if a function is activated? Thanks Hoss, I had tried to export based on those settings, but when I tried to open the resulting Nif File, there was nothing there. I'll try it again though, just in case I made a mistake. @Cyber Burn: I don't know the why's but Blender will often not export information that isn't actually selected, be it a nif or any 3d model format. To select everything press A and it should all show up pink like in the screencap above, then go ahead and export the nif file. Another issue you will run into often is an error related to textures. My resolution to this is to delete any extra parts, especially when their models show up as black shadows in Blender, then export whats left and copy the new parts into the nif I'll actually be using in the end. To get ahead of this as well always keep a clean copy of the character on hand while working a project. That is to say a nif that you haven't added anything to or altered in anyway from the original. Using a clean copy will lead to less problems in the long run as well as be easier to make weight assignments with. Myself whenever I export any new piece it's always to a separate nif then I Nifskope it into the main. Thanks SA, I'll give that a try. On a side note, I think I'm running a different version of Blender than you are. From the Pic, it looks like you're running Version 249, while mine says 248. I'm using 2.49b as recommended by the plug-in developers as well as the same Python versions they called for.
" Alt+H " is the hotkey to unhide all parts when needed. @ Hoss: Thank you. I'll add that information to my notes. @ SickAlice: I had thought I had downloaded things according to Ewzzy's instructions, but I'll go back and download the files suggested in the link you provide. OK, new dumb question time. Question #3: Should I un-install everything I've already installed and start fresh? Or can I just install the updated files? I'm assuming I would need to un-install everything else before I install the new files, but I would prefer to make sure. Personally I'd uninstall everything and do a clean install. Thanks SA, that's what I was thinking, but hearing it from someone who knows verifies it so I don't mess it up. Unfortunately, I can't seem to install everything. I'm thinking it may be because I'm running a 64 Bit System, and the Python 2.6.6 is geared for a 32 Bit System. I have Windows 7 x64. Looking at it I have 2.6.4. installed (just noticed this) . Works fine (my understanding is Blender 2.49b needs 2.6.x.). It's been awhile and I can't remember the exact link but I found that installer (x64 version) somewhere on Python's homepage. Thanks again SA, I just found the 2.6.4 x64, so I'll give this another try and see what happens. I appreciate all of your help. EDIT: So I'm looking at the Blender - NifTools page, and I realize that it recommends that 2.4.9 be used for Import/Export only, and that 2.7+ be used for "Production Work". Is it possible to have 2 different versions of Blender set up on your Computer? I never tried it though the answer on the Blender forums is a big yes. I don't think you need it though, I'm not limited by 2.49b or at least in any way I'm aware of. I.e., I am able to do production work fine in 2.49b. Perhaps the plug-in was still unstable for 2.49b at the time that article was written, just guessing here. For a little jump start here is a cheat sheet for weighting as according to Randomdays tutorial. 0a.) Select the new 3d model and switch to Edit mode. 0d.) Press Ctrl+A. A menu will come up. Select Scale and Rotation to Obj Data. 1.) In Object mode, select the original body and/or piece you wish the new one to act like (like a cape for example) using Right Click on your mouse. 2.) Select the new 3d model using Shift+Right Click. 3.) Switch the Window Type to Scripts Window. 4.) Select Scripts>Object>Bone Weight Copy. 5.) Set Quality to 3. Hit OK. 6.) Select the original mesh and delete it (Right Click+delete). 7.) Select the new weighted mesh. 8.) Select the Scene Root using Shift+Right Click. 9.) Hit Ctrl+P. A window will pop-up. Select Armature. 10.) If everything isn't already unhidden do so now by pressing Alt+H. 11.) Press Alt+A twice to make sure everything is selected. 12.) File>Export>Netimmerse/Gamebryo. Check off the box for the desired game. 13.) DO Not Copy Over the original character.nif! Name the new one something else. From here open up your new nif and the old one using Nifskope and put the new part into the old mesh. Adjust and add texture settings like you normally would and adjust the position of the new piece (the relative Translation and Rotation will be located in the node you dropped it in). Save your work and your done. Tip: Often when working with any specific mesh it will open up in Blender in a certain pose making it very hard to line up a new model with. Always work first with the base mesh and then move your work from there to the desired one. So use male_basic, female_basic and so on as they will be in an easy pose to work with. For Ink's female meshes use Storm Classic. For Gren's/JP's I find it's best to Skope that body into a basic and work from there, like take his male and put it into a male_basic. Ewwy's crymsin female can be worked from the original but you'll run into the hassle of trying to work with several meshes that way, so either put the choice body in a male_basic mesh or delete every body but the one you want and work from that nif copy instead. I am always eager to add more notes to the collection, so I definitely appreciate this. On a side note, I had to go back to Blender 2.4.8 because I could not get 2.4.9 to install. But since I'm still in the "Noob" category, that's alright, I figure this will still allow me to learn a little at a time. You'll have to say how that version works out. Mainly I listed all that because the keyboard shortcuts are a lifesaver. I use most of that every time I use Blender and before I knew that I was sitting scratching my head. Trust me it will come in handy in the long run. So I've been trying to mess with Blender a bit here and there, trying to follow Ewzzy's instructions, but I'm getting a bit stuck. This is pretty much where I start getting stuck. I can't figure out how to bring the face up close like on the top right, and therefore, I am having trouble seeing what I am actually doing. Does anyone have any idea what I am doing wrong? Thanks in advance for any help on this. There are two ways to do this. Either use the scroll wheel on your mouse or hit Ctrl and the "+" symbol on your number pad to zoom in or Ctrl "-" to zoom out. You can also use Ctrl and the direction arrows on your number pad (2, 4, 6, and 8) to move the mesh up, down, left, or right. You'll need to reposition the mesh as you zoom in or out to keep the area you want to work on in view. ^ added, you can zoom using the mouse wheel as hoss says. You can also move the view Up/Down by holding Shift and moving the mouse wheel, Left/Right by holding Ctrl and moving the mouse wheel. I usually use that method as my finger is already on the wheel to zoom in and out anyways. Much appreciated guys, I'll give that a go. Thank you. Very much appreciated SA, I had the site saved on my Wife's IPad, but it kept crashing it. I forgot about it after a while, so I appreciate you posting this link. So I've been trying to use RandomDay's Blender Tutorial to import Characters into FFvt3R. Unfortunately, I have yet to succeed. To make him look a little better, go to Edit mode, leave everything selected (yellow lines and pink faces) and go up the "mesh" button to the left of the "Edit Mode" button. Click on it and from the popup menu, select faces -> set smooth. Going back to object mode, he looks a bit different. I click on the box where it says "Object Mode", but the only thing that pops up is "Object Mode". I know there are supposed to be other options (Edit, Sculpt, Etc. ), but for some reason, only "Object Mode" is showing up. To see what textures are being used by the mesh, click on the "Window Type" button on the far left. We'll leave 3D view and got to Outliner view. You'll probably have to scroll wayyyy over to the left, by holding the middle mouse button down, to see what we're looking for. Once you scroll over, click the arrow key to open up the mesh info. You'll see the various parts of the mesh by material and what textures are being used for them. These are the only textures we need - the rest in the ripper directory were for the background areas. I can get to "Outliner View", but I can't figure out how to see which Textures go with the Mesh from there. Now that they are as close as possible, we need to adjust their poses to be as exact duplicates as we can. Select the .nif and enter pose mode. Turn on X-ray to see the entire armature. Adjust the position of the individual bones with the "R" rotate key. The main body should be all right and just the arms and legs might have to be adjusted. Adjust one limb at a time, doing the upper portion first and then the lower ones. Adjust each limb in both front view and side view. Last, some of the bones might be too long or short to match the new mesh, so we can adjust the length of the bone to extend or shrink the mesh to match. Changing the length of the bones also changes the size of any mesh attached to it. This doesn't matter for the main mesh, but will for the other items. You'll have to rezero the size of any that's been changed with "Ctrl" +"A" You can adjust the length of a bone by selecting it in Pose mode and changing its Scale Y value on the transform panel. 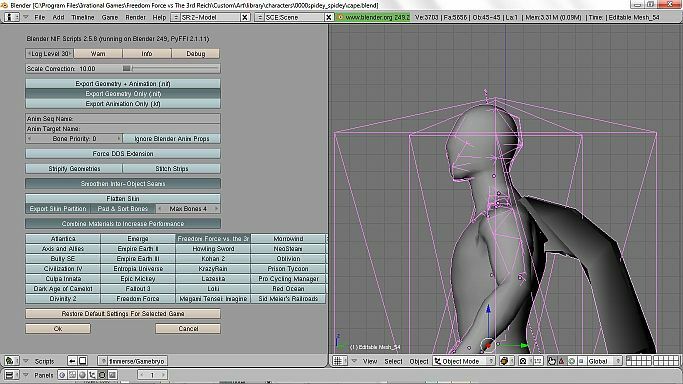 If I'm understanding this correctly, I want to adjust the Bones of the "Male_Basic" Mesh to match the positions of the new (.Obj) Mesh? Not the other way around? And this is done using "Pose Mode"? Wow, and this is just the first lesson. I definitely appreciate any advice and clarification that I can get here. Thank you. I can help with your first problem, as it's happened to me before. When you first import your nif, everything is showing as selected. Just right-click on the piece you want to edit and all of the other menu options will now show up for you to choose from. If you haven't hidden anything and still want everything to be edited, then just hit 'A' to Select All again and the menu options will still be present. That worked, thank you Hoss!